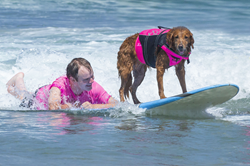 Surf Dog Ricochet & Patrick Ivison went surfing to celebrate their 10th anniversary of the first-ever canine assisted tandem surf session between a dog and an individual with a disability. Ricochet has been balancing boards... and lives for the last 10 years! Ricochet pioneered the concept of kids surfing with dogs as a form of assistance, healing, therapy and empowerment when, on August 20th, 2009, she made an independent decision, to jump on Ivison's board. Something like that had never happened before, and history was made, so was a video that went viral. It comes with a "Kleenex alert" warning and has more than 12 million views on Facebook and YouTube, which can be viewed at this link https://youtu.be/BGODurRfVv4. Patrick has since graduated from college at USC, lives and works in LA, has a girlfriend, an apartment, friends and the confidence and independence to live a full and "normal" life. "I can trace everything in my life back to surfing with Ricochet and that first fundraiser," says Patrick. "I've loved watching other kids get involved, and I love seeing their faces as they surf with Ricochet. I know that she is changing their lives as much as she changed mine." Although surfing has been at the forefront of Ricochet's work, it's not the act of surfing that makes her interactions with people so life changing. "For the past decade, Ricochet has balanced boards… and lives. She's offered individuals something no one else could – her incredible gift of healing, no matter the person's challenge, disability or angst," said Judy Fridono, Ricochet's guardian. "As I look ahead, I see her legacy as one that continues through every dog on this planet. I have learned an exponential amount about the healing power of dogs through Ricochet, and it's my privilege to share it with other dog owners so they can unleash their dog's healing power too." For more information, visit https://www.surfdogricochet.com/healing-power-of-dogs.html. Surf dog Ricochet, the SURFice dog!